Experiences with current High Flange Cassette hubs? Hell of a deal. Those wheelsets used to be a lot more. 3590 grams (126.6 oz) for both of these including tyres, inner tubes and cassette. 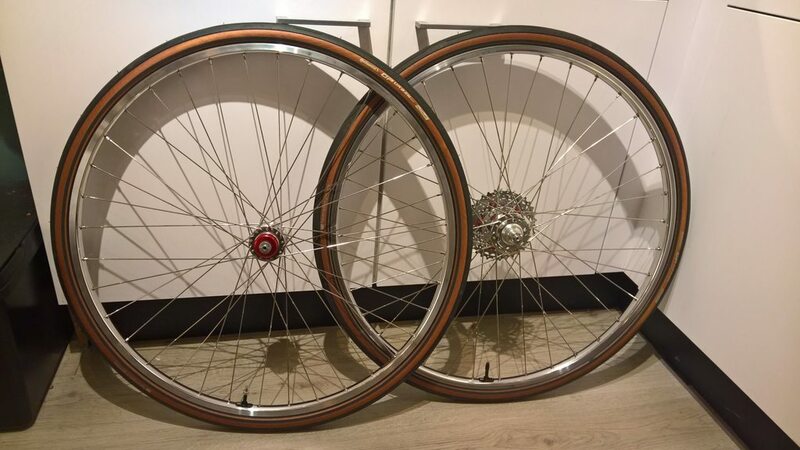 28 spokes with vintage shallow depth non aero rims? That may not be the best idea. It certainly would have been ridiculed BITD. There was always some bozo with 28h Medaille d'Or or gold label wheels. Maybe these rims are sufficiently heavy/beefy. Could be since they don't spec the weight. That is a good deal though. Less than buying the parts and building yourself. That is a good deal though. Less than biuying the parts and building yourself. These are the modern Pacenti Brevet rims that are 435g (in 650B) and have a max tension of 125 kgf. Hope they’re up for the job, as I have a couple in 28h waiting to be built up. Sand blast and powder coat a 753 frame?